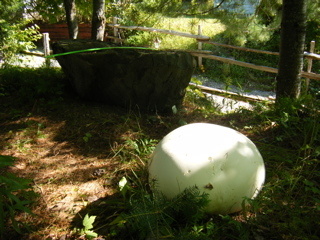 Last weekend we found a giant puffball mushroom growing in the forest behind the garage at our cottage in Ontario. The circumference measured 47.5 inches! It is an exact replica of what we buy in the grocery store to fry up with our steak, only much, much larger. 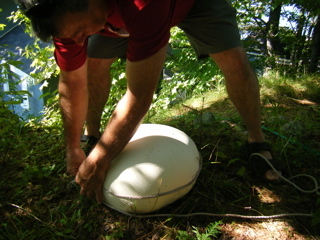 Here are a few photos of our puffball mushroom. Because we'd never seen one before and it took a few days to discover exactly what it was, we didn't get a chance to slice it open and eat it. 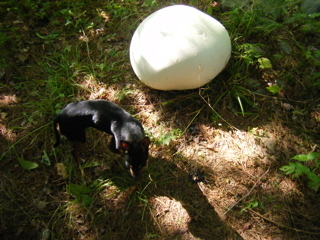 You'll see our attempts to measure the thing; and a pic of our chihauhau standing near it (good for size comparison). Wow. 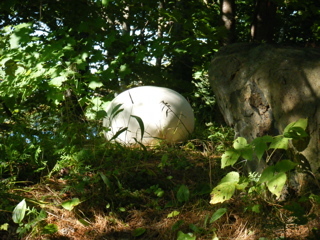 That is an incredible puffball! These pictures are fantastic, they really give you a good feel for its massive size. A circumference of 47.5 inches, or 120.65 cm, is pretty impressive. (For those who don't know, the circumference here is the distance around the object, what the gentleman in the last picture seems to be measuring). 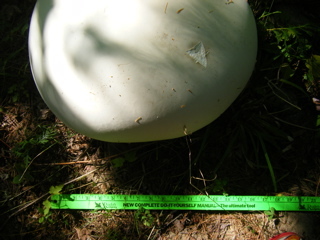 Want to make your own mushroom submission? It's easy! 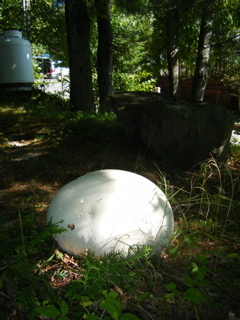 Just click here to return to the Mushroom Pictures and Stories page.